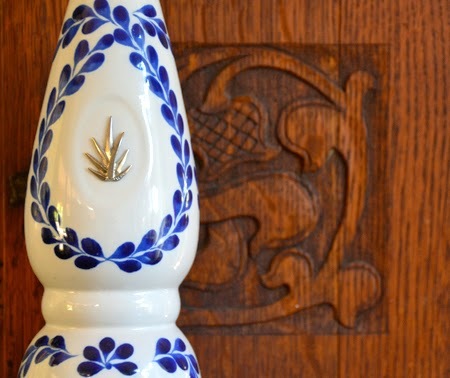 Before moving to Tucson, we didn't know much about tequila. All we knew were the here-say of "shots" and bad margaritas. That was in New England, home to bogus “Mexican” restaurants, where frijoles in any form meant nothing but New England Baked Beans! The convention’s inevitable final banquet of regional cuisine was preceeded by a tequila tasting. (Now do you see why I thought it sounded like fun?) From what I can tell from the outside POV, it was "educational" because it was about local foods. I got a blurry call from Mark after the tasting. I was in Maine freezing; he was basking in Tucson’s April warmth. He shared with me that he had sipped tequilas - straight, no ice - that were smoky and scotch-like. What's not to like about that? 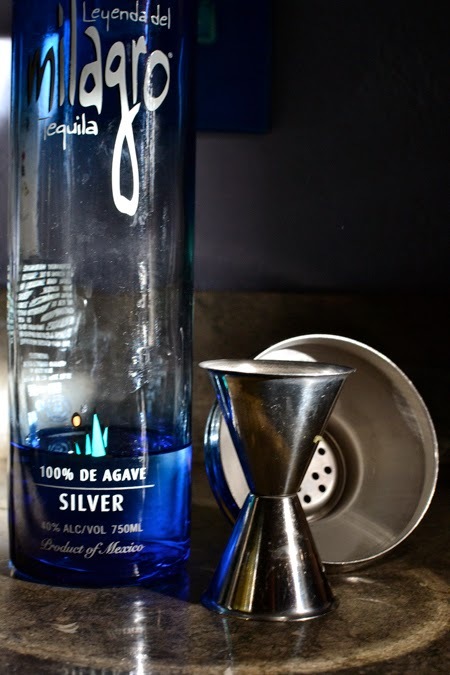 And then, Markipedia shared the differences between the five categories of tequila: blanco, or silver (unaged in stainless steel or neutral oak barrels); joven, or oro/gold (unaged silver tequila that may be flavored, colored, and/or sweetened); reposado (aged a minimum of two months, but less than a year in oak barrels); añejo (aged a minimum of one year, but less than three years in small oak barrels); and extra añejo (aged a minimum of three years in oak barrels). That is a lot of educational information! 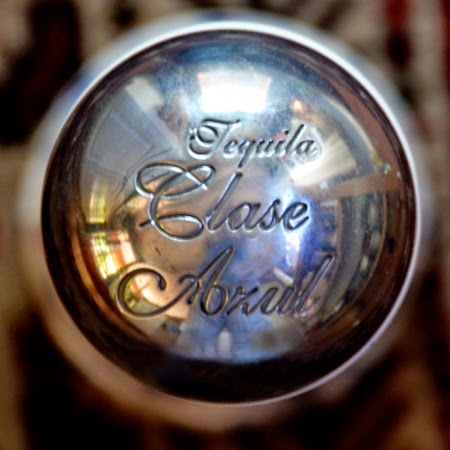 Now that we are a little more knowledgable about the subject, we keep two kinds in the house: tequila for sipping, and tequila for cocktails. 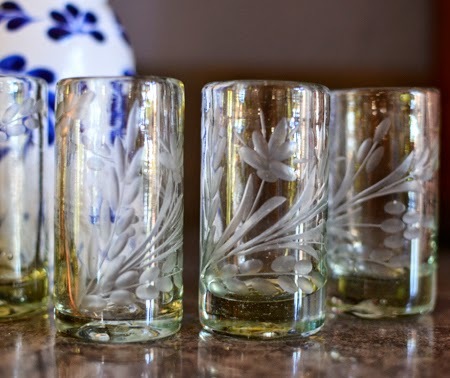 We prefer (and can afford) reposado for sipping, and and use blanco/silver for our cocktails. 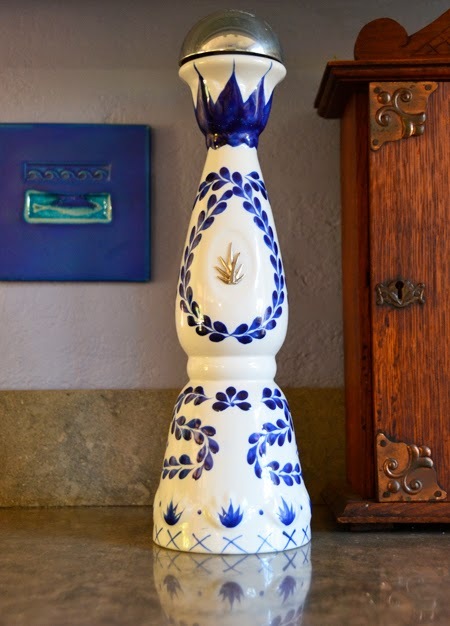 The beautiful blue and white bottle is our favorite reposado - Classe Azul. Today, was a cocktail day. We are trying to use some of the last lemons on our tree. A tequila cocktail came to mind. With citrus season approaching in the southern hemishere, and summer approaching in the northern, your thoughts might be going in this direction, too. My guess is that, when you think tequila, you think limes. Me, too. But when we were visiting friends Denny and Trudy in New Mexico, they served us tequila sours. Dare I say they are better than most margaritas we've had? They shared their recipe - and today I share it with you. The measurements are not difficult: 4 parts tequila, 4 parts simple syrup*, and 3 parts lemon juice. 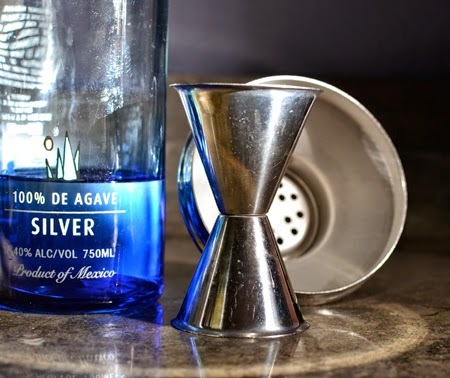 Blend the ingredients in a cocktail shaker or pitcher. 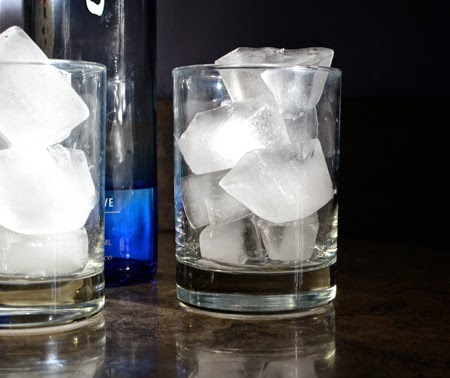 Fill glasses with ice. Pour tequila mixture over ice. Makes 2 large or 4 small sours. * Simple syrup: combine 1 cup water with 1/2 cup superfine (or bartender's sugar) in a microwave-safe pitcher or bowl. Cook on high power for 1 minute; stir. Mixture will be a bit cloudy. Microwave another 30 seconds. Mixture should be clear. If not, microwave for 15 seconds more. Stir, and let cool. Keep any leftover simple syrup on the refrigerator for 1 week. I tend to like simple syrup that is 2:1 (water to sugar) versus the 1:1. Thanks, Greg - coming from you that means a lot! I'm not a big Tequila fan, but this sounds wonderful!! I was never a big fan of margaritas, and I blamed the tequila. But I love these! Maybe you will, too, Christina! I discovered añejo about ten years ago on a trip to Austin. At least I kind of remember I did., it's a little fuzzy ;-). 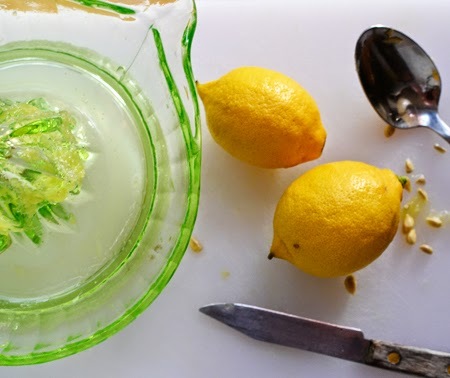 This cocktail sounds wonderful, and I love the use of lemons! 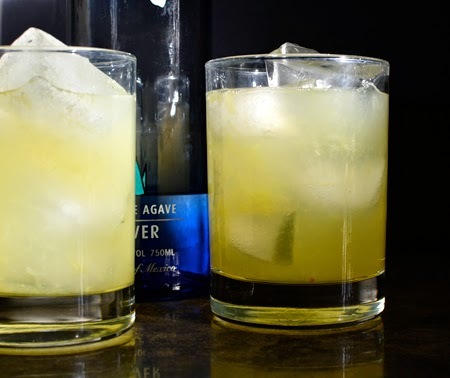 Just finished working on an Indian margarita for a client - with ginger and turmeric - you'd love it! Can't share recipe (legally) but maybe I started the mental culinary gears moving, and I bet it would be a fun afternoon of experimenting in your kitchen! It sounds like you had the perfect introduction to añejo!! Mmmmm....that sounds really delicious! Because it's been so warm (for 7,150 feet) we have started our afternoon drink in the sun. I do have two bottles of tequila that we have not tried. Here's the cute story about them. Several winters ago there was a knock at the door and two very cold Mexican nationals were invited inside to warm up. They had slid their pick up off the snowy and icy high mountain road above our house and could not get it out of the ditch.They had walked down the hill about 2 miles. We warmed them by the woodstove and offered hot tea while I got to practice my Spanish. They were so nice and grateful and told me that "the next time they went to Mexico they would bring us some bottles of the best tequila." We called them a tow truck and off they went. A few months later they returned and presented us with the promised tequila. They were rather expensive ones, too. So...we will try your tequila sour very soon. Happy Spring! That is such a sweet story, Caterina! What kinds did they give you? Here is a link to one of the bottles. https://www.beltramos.com/spirits/Jose-Cuervo-Tequila-Reserva-de-la-Familia-Anejo-w1244594cz The website says it costs $124.99. The bottle is dated and was sealed with wax although I don't recall that it was in a special box. I found that my hubby has been enjoying sharing shots of it with his buddies! I need to try it, too. The second bottle was certainly way less expensive. It is called "La Perseverancia." Tequila reposado. I didn't research that one. Guess I don't have perseverance, heh, heh. On a related subject, we tried mezcal when we went to Oaxaca and brought some home. We really liked it but have not splurged on more. If I ever go back there, I will bring home as much as is permitted. It was delicious! What an interesting country is Mexico! Wow - that Extra Añejo looks amazing. I want to see if I can find it here... my reposado might have to take a back seat! I imagine La Perseverancia might be pretty wonderful, too. Yes, México is pretty amazing - I am so glad we love so close. We have a lot of exploring to do, and Oaxaca is one of the places I dream of going. Great post, David... sharing this with my Peter, who loves tequila! Thanks, Liz - I hope Pete liked them! Never had a Tequila Sour before, D.
Something tells me I have a lot to learn about tequila. I tend to avoid it because it gives me heartburn, plus the fact it generally knocks me off my seat. Too funny, John - I guess it's a quantity AND quality issue! When you are here, we will do some good tequila tasting. 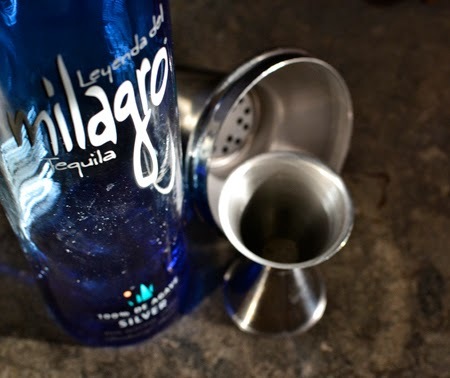 We love tequila and are always looking for new ways to enjoy it - thanks for sharing! Thanks, Nicole! Hope you enjoy a TS soon! They'd be great with your Mexican breakfast/bruch casserole! If these are better than a margarita, I must try it! I have been trying to make the perfect margarita to no avail. We even had the bartender at our favorite restaurant (for the drinks, more than the food...) share his recipe with us, and let us buy the sweet and sour mix he uses! Still, just not the same. The picture of the drinks is making my mouth water - and such simple ingredients. Definitely going to give it a try! Cathleen, I think I just had the perfect margarita across the border in Nogales. It was simply silver tequila and Mexican lime juice. Nothing else. I think you might like these sours - they are as easy to drink as they are to make! I am so very fussy about my margaritas that I rarely order them--only if I know they are good. Just the right amount of sweetness, lime juice, cointreau, and the right tequila! I've got some home made tamales in the freezer--I will try tequila sours instead of margaritas! BTW, that bottle of tequila is beautiful! Isn't the bottle beautiful? Yes, I am shallow enough that I bought my first bottle just for the bottle. But then fell in love with the contents! :) Susan, you definitely need to try the sours, but also (next time you are here) we can take you to Nogales for the best and simplest margaritas ever.